How neoliberal doctrine undermined the Obama administration and ushered in the age of Trump. 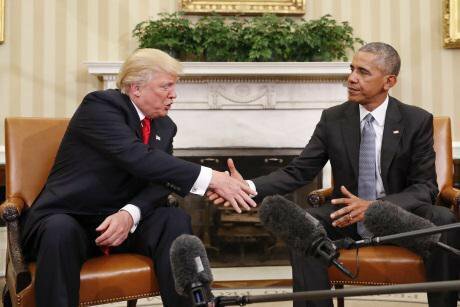 Obama meets Trump. Press Association/Pablo Martinez Monsivais. All rights reserved. The iconic slogan “Yes, we can!” inspired the wave of enthusiasm that swept up millions of Americans during the presidential election of 2008 and carried Barack Obama to the White House. If that slogan epitomized the beginning of the Obama presidency, he had an equally iconic ending: the first African-American president shaking hands with the first president-elect in at least 100 years endorsed by the Ku Klux Klan. In November 2008 Barack Obama won the presidency with almost 53% on a voter turnout of 58%. The winning percentage was the highest since 1988 and the turnout the largest for 50 years. The first non-white president took office on a surge of enthusiasm exceeding any since Franklin Roosevelt in 1932 (by comparison John Kennedy went to the presidency with less than half of total votes and a winning margin of 0.2 percentage points). The enthusiasm for Obama arose from fervent hope for specific changes: 1) a universal, affordable health system; 2) the end of two disastrous wars (Afghanistan and Iraq); 3) economic recovery from the worst collapse in 80 years; and 4) action against banks and bankers to prevent a recurrence of the collapse. To fulfil these hopes, Obama had majorities in both houses of Congress, 58 of 100 Senators (largest majority of any party in 30 years) and 257 seats in the House (most since 1992). By any measure the new president enjoyed an overwhelming majority. Under some circumstances the Republican minority in the Senate could prevent voting, but a determined and bold president could force votes within the arcane Senate rules. It quickly became obvious that Obama would be anything but determined and bold; on the contrary, avoiding conflict through compromise would guide his presidency. In face of a solidly right wing Republican opposition, attempting to compromise was recipe for failure, a disaster foretold and fulfilled. Despite the large House and Senate majorities a litany of failure dogged the first two Obama years, some partial and others presented as success. Extension of the popular Medicare programme offered the obvious method of achieving a national health system (confusingly dubbed “single payer” by its adherents). Obama yielded before opposition from private “health care” corporations and drug companies. The result was an extremely complicated, expensive and inefficient system acceptable to private interests. To make a bad outcome worse, seeking a non-existent compromise, the president delayed passage of the “The Patient Protection and Affordable Care Act” for so long that no one enjoyed the limited benefits before the mid-term election in 2010 (it became law in March 2010). The Republicans would use attacks on the president’s dubious triumph to regain control of the House of Representatives and almost seize the Senate. The quickly enacted fiscal stimulus (February 2009), American Recovery and Reinvestment Act, brought the closest thing to success. Because the president failed to challenge the Republican hysteria over the fiscal deficit that the stimulus necessarily increased, the mildly successful recovery package would also serve Republican election propaganda. Having lost the propaganda battle on health care and recovery, Obama scored a third own goal by declining to prosecute any financial executive for the illegal dealings that helped provoke the Great Recession of 2008-2010. This failure combined with massive capital replenishment of banks handed the right wing Republicans a slogan more natural to progressives, “bailout Main Street, not Wall Street”. Finally, far from ending the two wars began by his predecessor, Obama continued to wage them, even expanding US military operations to other countries with extensive use of military drones as the preferred killing agent. The specific promise to close the brutal detention camp on Cuban soil is unfulfilled. Like Bill Clinton before him, Obama remained popular despite his failures. Like Clinton his eight years as president would after the initial hope decline deeper and deeper into failure. Perhaps the most shocking of these was the failure to mount serious opposition to the Republican gutting of the law protecting the right to vote, a savage blow to his fellow African-Americans. Weakening of the Voting Rights Act was de facto endorsement of state laws throughout the country restricting the rights of citizenship. Had Obama ended two unpopular wars, supported an effective recovery programme, quickly forced through a Medicare-based health system for all, and aggressively reformed the US financial sector, he would be hailed as the greatest president since Franklin Roosevelt. Instead, he leaves condemned, yet another Democratic president whose neoliberal economic policies fed a rising of inequalities and shrinking of the well-being of the vast majority. Had Obama ended two unpopular wars, supported an effective recovery programme, quickly forced through a Medicare-based health system for all, and aggressively reformed the US financial sector, he would be hailed as the greatest president since Franklin Roosevelt. Wars, a flawed health care law and high unemployment did not give Donald Trump the key to the White House. The Chief Justice of the Supreme Court will swear in the most dangerous president in American history for a different reason. Beginning with Jimmy Carter in the 1970s the leadership of the Democratic Party enthusiastically worked to make neoliberal ideology mainstream consensus and Donald Trump is the outcome. An equitable sharing of the benefits of economic growth is the necessary condition to sustain democracy in a capitalist society. This condition was the basis for the so-called New Deal coalition forged by Franklin Roosevelt in the depths of the Great Depression of the 1930s. It would serve as the guiding principle of the Democratic Party through the presidency of Lyndon Johnson. The policies to achieve this equitable sharing had a common theme, restrictions on the functioning of markets, with the purpose of preventing the anti-social consequences of capitalist competition. Concretely these restrictions were 1) trade unions to limit labour market competition, 2) anti-monopoly laws and strict regulations to prevent concentration of corporate power, and 3) severe constraints on financial capital. Neoliberalism was and remains the antithesis of the New Deal political economy. In contrast to preventing the anti-social consequences of market competition, neoliberalism celebrates that competition, attributing its excesses to public regulation. With this inversion of logic, apologists for financial capital blamed the infamous “sub-prime crisis” on public regulation not fraud and deception by bankers. As America entered the twenty-first century, four decades of increasing inequality caused falling working class incomes and stagnation for the middle classes. Loss of hope in fulfilling “the American dream” increasingly undermined faith in US democracy. In 1932 an analogous crisis brought Franklin Roosevelt to the presidency to execute economic and social reforms that arrested the growth of inequality and, facilitated working class power through trade unions. In doing so Roosevelt “saved US capitalism”. In 2008 a similar task fell to Barack Obama, to propose and implement the reforms that would preserve popular support for globalization capitalism. America’s first African-American president chose instead to intensify the economic forces undermining that support. When Roosevelt became president in 1933, US income inequality as measured by the most commonly used index, the “Gini coefficient”, was over 50, and dropped to 44 by the beginning of this third term in 1941 (down to 37 by his death in 1945 and not above 40 again until 1982). 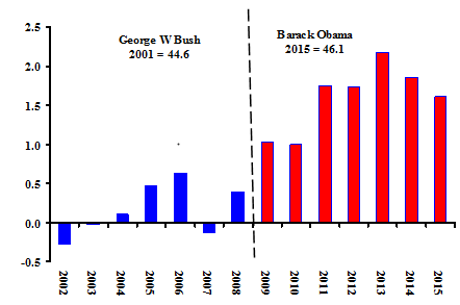 The chart below shows changes in that index of inequality during the George W Bush and Barack Obama presidencies, calculated compared to 2001 when the Bush was inaugurated. During the Bush years inequality fluctuated, slightly higher at the end of the eight years than at the beginning (up to 45.0 from 44.6). In every year of the Obama presidency through 2015 inequality was greater than in every year that George W Bush occupied the White House. A second chart shows rising inequality with more familiar numbers. By the end of the Bush years the share of income going to the richest 20% rose by a modest 0.4 percentage point compared to 2001, with the share of the bottom 60% down by less than a percentage point (-0.7). 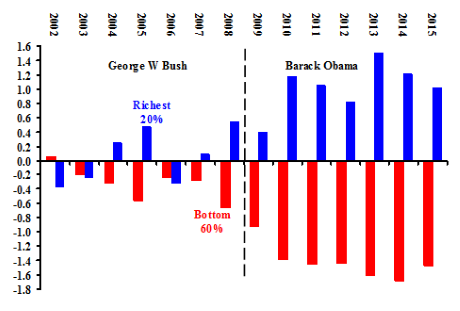 Except for 2009, the share of the richest 20% during the Obama period was higher than in any year Bush was president. The bottom 60% had a lower share in every year Obama was president. The final chart, taken directly from the Monthly Labour Review of the US Bureau of Labor Statistics, shows the inequality story for all US wage earners from 2007 to 2014. The vertical axis measures percentage changes in constant dollars, while the horizontal axis shows wage earners from the lowest paid to the highest. Only the employees in the top 15% of the distribution gained an increase in real pay. The red line that includes all wage and non-wage benefits shows less concentrated gains, but even by that measure over sixty percent of earners suffered declining income. These statistics demonstrate not only the decline of working class incomes, but also the famous “hollowing out” of the American middle class. Compensation & wages vertical axis, position in distribution horizontal axis. Source: US Bureau of Labor Statistics. “Compensation” includes all non-wage benefits. Fifty years of democratic capitalism was the historic accomplishment of the New Deal. Relatively low and stable inequality provided the basis for what some call the “Golden Age” of US capitalism. In 1974 under a Republican presidency (Richard Nixon, replaced in mid-year by Gerald Ford) US income inequality dropped to its lowest as measured by the Gini coefficient. Subsequently, under presidents both Democrat (Jimmy Carter, Bill Clinton, Barack Obama) and Republican (Ronald Reagan, George H W Bush, George W Bush) inequality rose inexorably. Rising inequality revived social divisions subsumed by prosperity during the “Golden Age.” Donald Trump encouraging and exploiting those divisions is the vehicle for a transition to authoritarian capitalism. With Donald Trump neoliberalism fulfils its logic, destroying even the illusion of a just society.